I ordered the SuperJennie on the 9th. It arrived today, the 13th. It shipped from California, and I am in Texas. I took a bunch of comparison photos. It feels squishier than the large Lunette and Large Fleur. It also feels a bit sticky because it doesn't have the peachy finish on it. The one thing I do like is that it has measuring lines, I just wish it had more. 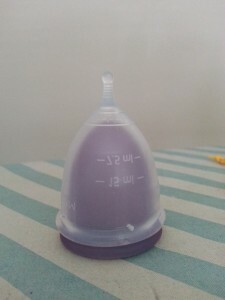 If you make a cup with that much capacity, why stop the measuring lines at 15mL? I think I'll have the opportunity to try it out very soon and I'll write a review then. The cup with the bag it came with. 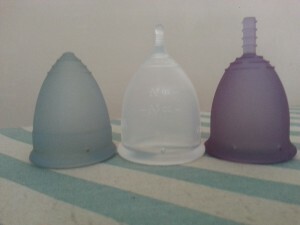 Blue on left is large Lunette, SuperJennie in the middle, Large Fleur on the right. Showing how the rims are the same diameter, but shaped slightly differently. They seem to squish the same amount. 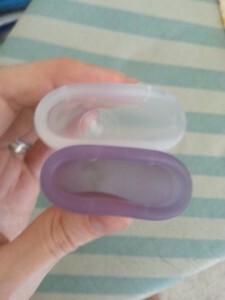 The large Lunette fits inside! So does the (bare) large Fleur. 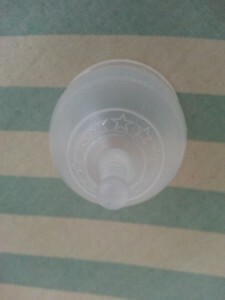 It has stars between the grip rings if you are into decorations. Sweet! Thanks for posting pictures and giving your impression. I've been wondering about the SuperJennie! Nice! That is weird that the lines only go to 15. You'd think that they'd go halfway at least. Those star grip rings are pretty cute. I wish this cup had more of a stem! Very cute though. Thanks for the pics!! I expected a super hero bag not flowers!? I noticed the price has gone up from $16.95 to $18.95. So pretty with its frosted finish! Can you vouch for the 40ml capacity? I agree with elisamba! Please do a capacity comparison. 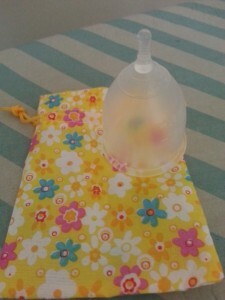 The cup measures approximately 37mL to the holes and 41 to the top. 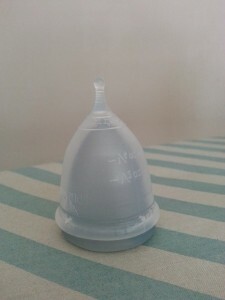 I don't think I've ever gotten anywhere near 37ml capacity, but I have a very dangly cervix that takes up a lot of room in the cup.